You could say I was born to play drums. My mother says that when she was pregnant with me, she would go to watch my father play,and I would kick to the beat of his drums. At age three, my dad gave me a practice pad and introduced drum rudiments to me. I took to it right away and couldn't stop pushing myself to work out the grooves. When I was six years old, a rogers kit was passed down to me. A new world of possibilities opened up. At age nine, I played my first gig with a band. Jazz drummers and funky grooves began to intrigue me. And I started to see drumming as a way of who I was. Around this time I began to win talent shows and competitions. I met a drummer Aron Walker from the band burning bus and started working with him on reading and grooving. Around the same time, I began lessons with a rock drummer Jamie Hess. After studying for a couple years, I was introduced to world class jazz drummer Clyde lucas. 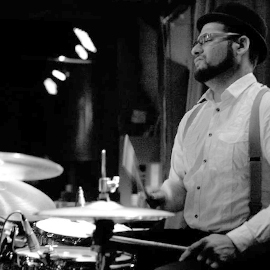 Providing a unique focus on gospel and jazz drumming, Clyde strongly influenced me and my love for drumming grew. I went on and earned a degree in drumming from Berklee College of Music, and have since attended many drum camps and clinics as well as still compete nationally. I have now created my own style, using all the great influences I've had over the years. Since the age 18, I have been working as a session drummer in numerous bands, including gospel groups, folk, rock, r&b, funk, even country. I have also opened for national bands and recorded with Grammy award winning artists. I have hosted open mics and met hundreds of musicians. I also now own and run a professional recording studio in Hershey Pa and teach a number of drum students.